Your partner for indoor sensing and navigation solutions. Precise navigation for your smartphone. Using acoustic time measurement, Telocate ASSIST is by far more precise than existing solutions for smartphone localization in buildings. Inertial navigation. 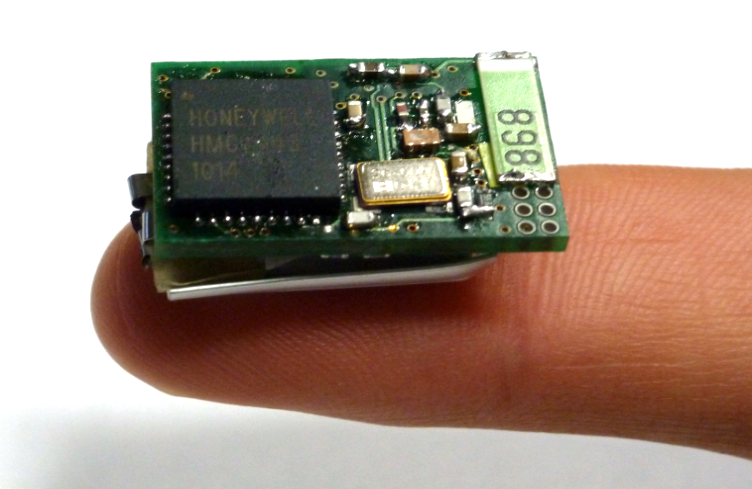 Our Telocate IMU is the world’s smallest 9-axis inertial measuring system. The IMU features am 868 MHz radio transceiver and integrated power supply. NEW! 05.03.2019: We are currently looking for a Software Developer for Algorithm Development. See Stellenausschreibung (german). 17.04.2018: The first customer service system for restaurants using our technology has gone live in the Thai restaurant Kaimug in Zurich Glattzentrum (CH). 19.12.2017: Our ULTa project team, represented by Dominik Jan Schott, wins the Best Paper Award for their publication on “Underwater Localization Utilizing a Modified Acoustic Indoor Tracking System”, as presented during the USYS’17 in Kuala Lumpur, Malaysia. 01.09.2017: Two years after the first frontierCities project in 2015 Telocate was now again granted funding in the FIWARE accelerator follow-up program frontierCities2 MAG. 07.06.2017: Telocate has been awarded second by BMWi as ICT foundation of the year 2017 as one of four startup companies (video). 16.02.2017: The technology foundation BioMed Freiburg awards Telocate as one of five companies the Freiburg Innovation Award 2017. 09.02.2017: German television SWR shows a clip about the Telocate navigation system for blind and visually impaired people (SWR Mediathek, at 16:20). 01.02.2017: For the development of their smartphone localization solution ASSIST the Forum Angewandte Informatik und Mikrosystemtechnik awards the founders of Telocate the FAIM award 2016. 10.11.2016: Telocate gives a talk about the Chances of Indoor Localization on Intralogistik-Kongress 2016 (Program) in Waldkirch. 10.10.2016: On the Convention of KMU-innovativ: IKT Dr. Höflinger discusses with TV host Kristina zur Mühlen and project representants from academics and business collaboration potentials for innovative SME companies. 22.09.2016: Dr. Höflinger presents the innovative approaches of Telocate on the WRF congress Industrie 4.0 – Chances for the SME sector? (Program) to a broad audience from industry and politics. 03.08.2016: Telocate has joined the Intralogistik-Netzwerk in Baden-Württemberg e.V. The nation-wide, non-profit association of over 80 members from industry and academia is especially dedicated to knowledge and technology transfer in the field of intralogistics. 11.04.2016: In the Microsoft Indoor Localization Competition in Vienna Telocate (team “Hoppe”) places second in the category 3D ultrasound localization and first using standard (COTS) hardware on the user side. 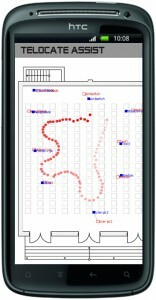 14.03.2016: Telocate presents a demonstrator of ASSIST on this year’s CeBIT 2016 in Hanover. 10.03.2016: Telocate gives on LogiMAT 2016 a keynote talk on the opportunities and recent trends in the field of localization in intralogistics to interested professionals. 01.02.2016: Telocate and the IIG of the University of Freiburg conduct a feasibility study together for the navigation of blind people using Telocate ASSIST. 15.07.2015: Telocate will participate in the FIWARE accelerator program frontierCities for the development of a navigation solution for blind and visually impaired people. 01.07.2015: The business magazine brand eins has published an article Echolot fürs Handy (german) about Telocate ASSIST. 20.03.2015: Telocate presents a demonstrator of ASSIST on this year’s CeBIT 2015 in Hanover, see CeBIT Impressions and the Image Gallery of German BMWi. 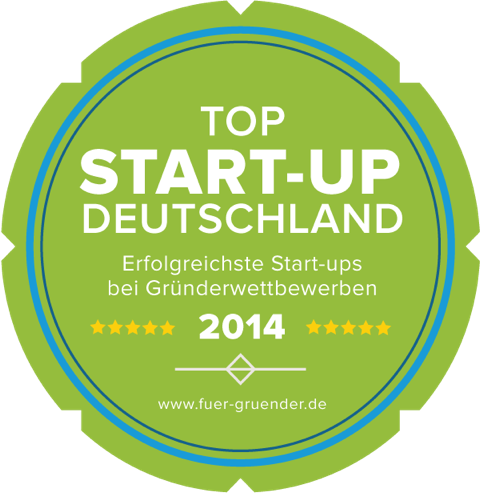 10.02.2015: In their recent publication Start-up competitions and top start-ups 2014/2015 the German online portal Für-Gründer.de has chosen us among the Top 15 and awarded us as a Top Start-up Germany – Most successful start-ups at start-up competitions. 02.01.2015: Freiburg’s local news portal fudder.de has published an article about Telocate ASSIST: Der Freiburger Start-Up Telocate hat einen Indoor-Navi entwickelt (german only). 03.07.2014: In the start-up competition start2grow2014 in Dortmund the team Telocate managed to achieve one of the ten best places. 23.05.2014: For the start-up project Telocate the Exist stipend of BMWi has been granted to the three founders Dr. Fabian Höflinger, Dr. Johannes Wendeberg and Dr. Rui Zhang, supporting their university spin-off project for one year.